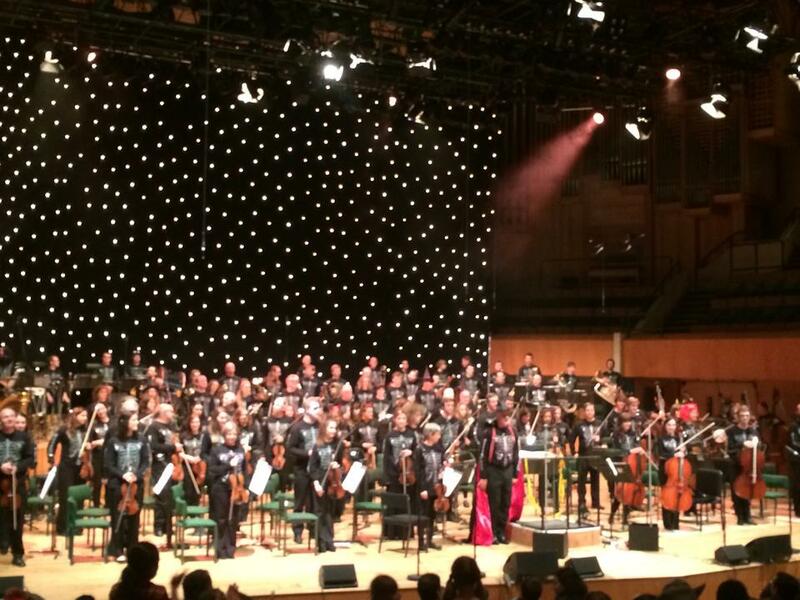 Every couple of years the National Youth Orchestra of Wales and the BBC National Orchestra of Wales take part in a collaboration. This involves students getting to play alongside BBC NOW players and get a taste of what it’s like to work in a professional orchestra. The last project like this was a part of the 2012 BBC Proms series, where the two combined orchestras performed Bernstein’s mass in the Royal Albert Hall. I wrote a blog post about that, so it you’re interested, you can read about it here. 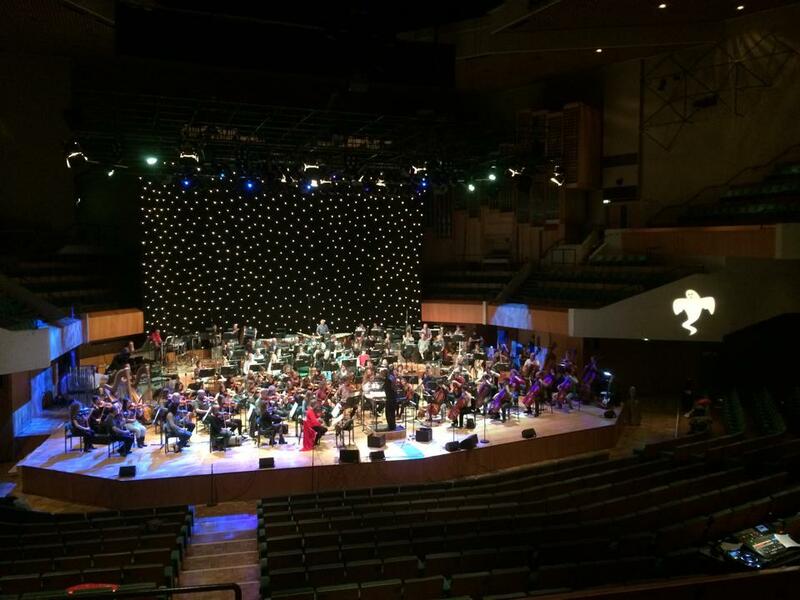 Last weekend, we got the opportunity to perform in a ‘Halloween Spooktacular’ in St David’s Hall, Cardiff. We arrived in Hoddinott Hall (part of Wales Millennium Centre where the BBC NOW rehearse) on Friday 24th October and were introduced to our BBC desk partners. Grant Llewellyn was conducting and it was great for the NYOW to be reunited with him, after he took us on a tour of Germany in 2013. The first day of rehearsal consisted of tutti (the full orchestra) until the last session. We got a chance to read through all the pieces (there were lots of shorter works, as it was a children’s concert) which included Harry Potter, Danse Macabre, Pirates of the Caribbean, Dr Who Theme and The Addams Family. This gave us an overview of the concert and got us used to the massive sound and energy the BBC NOW produces. The last 2 hours of the day were sectional rehearsals. We were split up into our sections and tutored on some of the more tricky bits by the section principals. This was really helpful as we got a chance to go over things slowly and were given fingerings and other ideas to help us play. Harry Potter is surprisingly difficult (there must be thousands of notes in the string parts) so that took up a lot of our time. On the Saturday morning, we started out with sectionals again. We covered some more of the tricky passages, but also focused on style and really working together as a section to blend and make a unified sound. For the rest of the day we had tutti, and made sure that all the difficult sections were fixed and any cuts in the music were sorted. It was interesting working in this way, because we covered a lot of music in a very short space of time. It helped me to learn how to manage my time better and will hopefully help me to practice more efficiently in the future. Sunday was the day of the concert. We arrived at St David’s Hall at 11am and had a few hours to rehearse before the concert at 3pm. The rehearsal was mainly taken up with getting cues of when to start the pieces right, reacting to the lights (and the members of staff who were dressed up for some of the pieces! ), covering a couple of the messy entries, and getting used to the acoustic in the hall. We then all donned our glow-in-the-dark skeleton tops and got ready for the concert. The audience all entered in their fancy dress (both adults and children) and we were ready to begin. As the hall was full of children under 5, there was a lot of background noise (which is unusual as at classical concerts it’s normally a cardinal sin to make noise of any sort during a piece) but it added to the atmosphere as you could tell they were enjoying it. In between the pieces, Grant was telling the audience about the different sections of the orchestra, the stories of the pieces and how we can use our instruments in different ways to make the ‘spooky’ sounds. The kids seemed to react really well to the concert. They were dancing in the aisles (after Grant had encouraged them in Funeral March of a Marrionette) and singing along (the Harry Potter and the Addams Family). A particular hit was the Stevie Wonder song Superstition performed by the principal flautist! However one of my friends in the audience did say that a little girl next to her got a bit scared by some of the monsters especially the devil in Danse Macabre! All of my ‘adult’ friends loved it too as it was such a feel-good concert. I feel incredibly privileged to be able to take part in concerts like this as I gain so much experience and orchestral etiquette from the other players. They are always fun events and both the BBC and NYOW players alike enjoy the concerts. Next Monday I’ll be telling you about a quartet concert that I am taking part in next Friday in the Old Royal Naval Chapel. We’ll be playing Shostakovich’s Piano Quintet and Barber’s Adagio. It’s at 13.05 if anyone is in the Greenwich area and free to come. Would be lovely to see some friendly faces! Hello and welcome back to Music of the Week! The return of ‘The Apprentice’ (a guilty pleasure) has influenced my first choice and a BBC prom I went to in the summer has influenced my second. Prokofiev’s ballet ‘Romeo and Juliet’ is a wonderful piece. In the section ‘Montagues and Capulets’ the famous low brass oom-pahs and the unison string melody stepping over the top in a dotted rhythm is the section from the ballet that most people know. (Or signifies that Lord Sugar is coming back to BBC1.) However, I’d really like to talk about the whole piece. I’ve seen the ballet and last summer I played the second suite in a concert with YMSO and discovered some other beautiful passages. The ballet was composed in 1935 and the ending was originally written so that it was happy, but he was persuaded that this would have been a step too far. It was written for the Kirov Ballet but because it was so tricky for the dancers it wasn’t performed for a few years (the premier was in Brno in 1938). Once the music had become popular he then wrote three orchestral suites and a solo piano piece based on the ballet themes. Aside from the ‘Montagues and Capulets’ theme (which is epic and so much fun to play), my other favourite movement from the suites is the ‘Death of Juliet’. It’s beautiful and has many moments of bittersweet passion and pain which could bring the audience to tears. My other piece that I’d like to share is a collaboration between the string trio (two violins and a double bass) Time for Three and Joshua Radin (an American singer, songwriter and actor). It’s an acoustic song called ‘Everything’ll Be Alright’. I first came across Time for Three at a BBC Prom. My brother is a huge fan of Aaron Copland and there was an ‘Americana’ prom last summer so I went with him to watch the BBC Symphony Orchestra play. I wasn’t sure what to expect in the second half as all it said on the website was ‘Brubeck’. I was in for a treat. The orchestra opened with ‘Blue Rondo a la Turk’ by Dave Brubeck, which had been arranged by his son (Chris Brubeck) for orchestra. This was very exciting but short, so my brother and I were left wondering what was coming next in ‘Travels in Time for Three’ (by Chris Brubeck). I loved this piece. An American string trio walked out and they proceeded to amaze us with a virtuosic performance of what was essentially a jazzy concerto grosso. After this, I went home and found as many different videos as I could by Time for Three. I was introduced to Joshua Radin by recommendation from one of my friends who emigrated to Canada when we were 16. We keep in contact through Skype, Facebook and email often share YouTube videos and songs. About a year ago, I was sent ‘Winter’ by Joshua Radin and that became one of my favourite songs. On Monday I was browsing YouTube, came across a collaboration between these two, and I loved it. Even though there is only a string bass, two violins and a voice with guitar, it’s magical and haunting. I hope you like it as much as I do! I’m looking forward to seeing you all on Monday, when I’ll be talking about a halloween concert I’m taking part in on Sunday with BBC NOW and NYOW. Last Thursday I took part in a concert with Orchestra Vitae at St John’s Smith Square. It consisted of Shostakovich Festive Overture, Brahms Symphony No. 3 and in the second half, Requiem by Stephen Montague. We had rehearsals leading up to the performance, however getting all the performers together was a problem (especially as the requiem required about 15 extra percussionists, an organist and a whole choir). Therefore, it wasn’t until the day of the concert that everyone played together. Saying that, the result was amazing. The concert opened with Shostakovich Festive Overture. This piece was composed in three days (we rehearsed for longer than that!) for the 37th anniversary of the October Revolution. This piece opens with a brass fanfare and transforms into a fast melody (first in the wind and then the strings). This is followed by a more lyrical passage in the horns and cellos and then reintroduces the first tune over the top before returning to the fanfare and then speeding to the end in a joyous coda. I love this piece. Not only is it by Shostakovich (who is my favourite composer at the moment) but it’s fun to play and is always loved by audiences because it’s exciting and has some fantastic tunes. We followed that with Brahms’ Third Symphony and I hadn’t heard this piece before. I had played Brahms’ First Symphony a few years ago and I remember that being very large and grand. This felt a lot more subtle (being the shortest of his symphonies), but still ‘Brahmsian’ especially in the 1st and 4th Movements. It opens with two powerful wind chords and then a string melody heading down in an F major triad. The symphony also ends with this motif, but with pianissimo oscillating strings. I like the cyclical nature of this piece and it feels very complete. The second half was the highlight of the concert for me. We played Requiem (The Trumpets Calling Them to the Other Side) by Stephen Montague. This had been very hard to rehearse as we were unable to get all of the sections (about 170 performers in total) together until the day of the concert. This piece was a complete contrast to the first half, as it was very atmospheric and used lots of extended techniques (especially in the strings – such as glissandi, playing behind the bridge and undetermined high notes). The performance begins with bass drums at the back of the hall quietly rolling in (this left the audience puzzling as to where the sound was coming from) and a call and response between an offstage and on-stage trumpet. This then transforms into a folk song sung by a solo mezzo-soprano. There are orchestral interjections around this and the choir begin to creep in. From then on the music grows through the next 25 minutes or so, starting with the chorus whispering ‘Dies Ire’ and growing to shouts from the voices, foghorn blasts, high semiquaver passages from the strings and shrieks from the brass. This then dissolves quickly down to the ending which represents ‘hovering spirits’ and the last sound you hear is the first violin section thinning down to one player whispering high up on the E string. This received a tremendous response from the audience . I thoroughly enjoyed playing it too as you feel like you’re part of something huge and it’s very exciting. It was such a pleasure to perform this epic piece in such a lovely venue. Next week I’ll be talking about a Halloween concert I’m taking part in with the National Youth Orchestra of Wales and the BBC National Orchestra of Wales (26th of October in St David’s Hall). Hope to see you then! Hello and welcome back to my Music of the Week blog. I wasn’t sure what to choose this week as I’ve been pretty busy and so have just been listening to whatever is on the radio in the morning. Today, however, two tracks jumped out at me. I hope you enjoy them too! The first piece is ‘Night on a Bare Mountain’ by Modest Mussorgsky, arranged by Rimsky Korsakov in this version (There are many other arrangements as well as the original tone poem. If you’re interested in finding out more, I’ve included a link here). In the original printed edition of the Rimsky Korsakov arrangement, the description of the work says “Subterranean sounds of non-human voices. Appearance of the spirits of darkness, followed by that of Chernobog. Glorification of Chernobog and Black Service. Sabbath. At the height of the sabbath, the distant ringing of a village church bell is heard; it disperses the spirits of darkness. Morning.” You can really hear the ghouls coming out, through the oscillating of the strings, the shrieks of the woodwind and the low and ominous brass chords. Listen out for the bell at the end and the retreat of the monsters. I’m preparing to play this in a concert on October 26th (a Halloween-themed concert with the National Youth Orchestra of Wales and the BBC National Orchestra of Wales) and have been loving practicing bits of it again. It brings back memories of when I first played it in my county High Schools Orchestra when I was about 14 and I’m having fun remembering hearing it for the first time. Hope you enjoy this spooky piece as a premonition for Halloween in a couple of weeks! The second track is Taylor Swift’s latest song called ‘Shake It Off’ (and could not be more different!). This is a big change to her normal country style (which I also love) and is so catchy! The music video is also great and really fun to watch. This has quickly made it onto our ‘getting ready’ playlist in the flat, which we use whenever we are all preening to go out to an event in the evening (so obviously a big honour to make the playlist…). I hope you like this song and have a little dance to brighten up your evening! I’m looking forward to seeing you all again for my next blog post on Monday. It’ll be about a concert I took part in last night with Orchestra Vitae in St Johns’s Smith Square where there were over 170 performers playing a program including the amazing Requiem by Stephen Montague. Last Wednesday I took part in a concert at St John’s Smith Square with the Young Musicians Symphony Orchestra (YMSO – http://www.ymso.org.uk/). We were playing a varied program including Berlioz, Tchaikovsky and Nielsen. This was a very challenging program and I hadn’t played any of the pieces before. We began the concert with Le Corsaire by Berlioz which is a concert overture (which means there isn’t an opera attached) written between 1844 and 1851 (there were lots of revisions). It’s a very fast and exciting overture with lots of bright and blazing string passages, enhanced by brass chords. The main challenge of this was the speed and when I was practicing I had to gradually increase the tempo in order to be able to play this at the same speed as everyone else! The other piece in the first half was the 1st Tchaikovsky piano concerto with Vitaly Pisarenko (a Masters student at the Royal College of Music). This is a gorgeous piece and has lots of beautiful tunes that both the orchestra and the soloist play. The main challenge with playing any concerto is adjusting to how the soloist wants to play it. After we had played it once though, I found that I got used to all of the hold backs and pushes forward so it became a joy to play rather than a stressful experience. The second half of the concert was Nielsen’s 5th symphony. This symphony has only two movements, but there are very clear sections throughout these which make it interesting to listen to. The symphony isn’t typically ‘romantic’ and there aren’t many tunes that would pass the ‘old grey whistle test’ , but Nielsen manages to create an amazing atmosphere and uses the various sections of the orchestra, such as the undulating violas at the start creating mystery and tension. Overall , the concert went well and the audience really enjoyed all three works. The piano concerto was the best received I think, but that was possibly because of its popularity. Personally I think the Berlioz was my favourite to play. *I don’t own any of the videos above, neither are they recordings from the performance. I just wanted to share the music that we played as I enjoyed it so much. I’m really looking forward to the next YMSO concert in November where we will be playing Bruckner’s 8th symphony. I’ll see you next week for a blog on a concert I’m taking part in on Thursday with Orchestra Vitae. It’s at 7.30 pm on 17th October at St John’s Smith Square if you fancy coming. The program includes Shostakovich, Brahms and Montague (with an 80 piece choir and huge percussion section) so should be an incredible concert! Hope to see you there. This was a challenging project for me, not only because I was playing alongside professional players but because of the rehearsal schedule. The performance was in August but due to the fact that the NYOW orchestra normally has their course end of July/beginning of August we weren’t able to rehearse close to the prom. Also, the ensemble was so large that we didn’t get all the performers together until the day of the concert, which was scary but added a huge level of excitement as well. I had never been inside the Royal Albert Hall before, so this was another new experience for me. The view from the stage was incredible and I felt tiny because of the thousands of seats around me. The conductor Kristjan Järvi knew the piece inside out and helped us all to understand its true meaning. The concert was a great success. The hall was almost completely full, and with the choirs behind the stage there was a face in every direction I looked. What I found the most odd was that because it was being recorded for TV broadcast there were video cameras situated throughout the orchestra. It was strange to be in the middle of a difficult passage and to have a camera zoom-in on your face! The performance received good reviews (http://www.theguardian.com/music/2012/aug/07/prom-32-bernsteins-mass-review) and I am so grateful and proud to have been a part of this Prom. If you fancy seeing this prom I have posted a link below (I don’t own this video). I hope you enjoy this music and this post. Next time I’ll be writing about a concert I’m taking part in with YMSO at St John’s, Smith Square in London on October the 8th. If you’re free, would be lovely to see some friendly faces!